OPEC crude production rose in July, despite sliding output in Libya, Iran and Saudi Arabia. The bloc’s output averaged 32.32 million barrels a day in July, up 41,000 barrels a day from June, the group said in its monthly oil market report, citing secondary source figures. Increased production in Kuwait, Nigeria and the United Arab Emirates more than offset the drop elsewhere. The Organization of Petroleum Exporting Countries agreed in June to increase output by 1 million barrels a day, in a bid to prevent sharp rallies in crude prices that could potentially curb consumer demand. 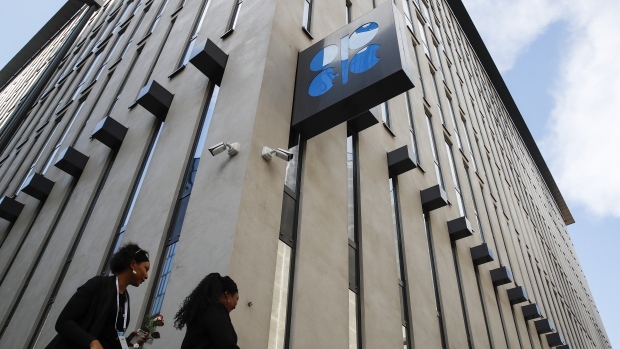 That came after U.S. President Donald Trump urged the group to act in order to prevent further increases, even amid looming American sanctions on Iran, OPEC’s third-largest producer. The potential for a supply shortage appears to have subsided for now, the International Energy Agency said on Friday. In direct communications with OPEC, Saudi Arabia reported that its monthly crude production slipped by 201,000 barrels a day in July, meaning that it pumped 10.288 million barrels a day last month -- lower than the 10.387 million figure secondary sources compiled by OPEC show. Bloomberg’s monthly OPEC oil production survey put the Middle Eastern nation’s output at 10.65 million barrels a day last month. While OPEC output rose in July, the group also lifted forecasts for supply from its rivals for the rest of the year. Non-OPEC production is now expected to be 59.62 million barrels a day in 2018, a 2.08 million barrel a day increase from last year. Those figures were mainly due to adjustments to production in China during the first half of the year. At the same time, OPEC lowered its global oil-demand growth estimate by 20,000 barrels a day, to 1.64 million barrels a day this year. That’s due to weaker-than-expected oil demand data from Latin America and the Middle East in the second quarter. It also said that trade friction between the U.S. and China was unlikely to have much impact on global oil demand growth, unless the rifts spread beyond those two nations. OPEC expects the demand for its crude to be 32.9 million barrels a day this year, about 600,000 barrels a day lower than in 2017.